How is a fireman or a firefighter? Norms of fire safety to premises of public power set out in the Rules of fire prevention regime in the Russian Federation, SNiP 21-01-97 "Fire safety of buildings and constructions" and SNiP 2.08.02-89 "Public buildings and constructions". Failure to comply with these regulations entails administrative liability. The main causes of fires in bars, restaurants and cafes are most often violations of the rules of operation of kitchen equipment. Sometimes a fire can occur due to problems with electrical wiring. In any case, the staff should be able to correctly and timely respond to the situation. In this connection it is necessary to have instruction on fire safety measures for each particular room considering its features. This manual is prepared by the chief or fire safety officer in accordance with the requirements of section XVIII "Rules of fire prevention regime in the Russian Federation". For each production or storage areas should be provided additional instruction. The head of the enterprise is obliged to undergo training fire-technical minimum. But employees can be taught basic fire safety standards with instruction. It may vary in timing and nature. There are introductory, primary, repeated, unscheduled, target briefings. Each of them is reflected in a single magazine of instructing, where the employees have to sign. If the institution operates around the clock, need to make a statement and for an overnight stay. In this case, made the plan of evacuation with photoluminescent coating. If a bar or restaurant is open only during the day, a simple evacuation plan. The main thing is to place it in a prominent place. Any premises, including premises of public catering must be provided with primary fire extinguishing means. Responsible for the acquisition, repair, safety fire extinguishers keeps records of their presence in the log of arbitrary shape. 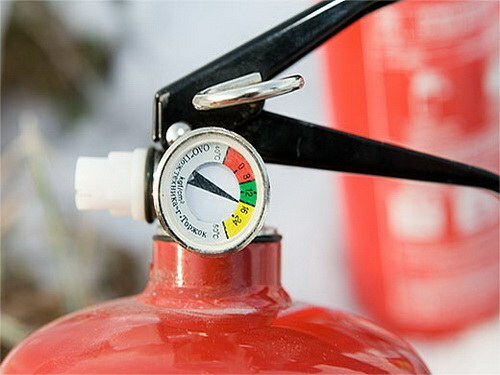 The sequence number is applied to the extinguisher body with white paint. The number, type fire extinguishers and norms of recharge can be determined in accordance with section XIX of the "Rules of fire prevention regime". Here in Appendix 1 provides a table of "Norms for the provision of hand fire extinguishers". In accordance with the fire code 110-03 restaurants and cafes must be equipped with the installation of automatic fire alarm system and notification of people in case of fire. Its type depends on the number of visitors. If the room is located in the basement or ground floor, it is necessary to provide for the pits. They serve to remove smoke and other dangerous factors of fire in case of fire. In the absence of pits such premises shall be equipped with a system of forced smoke. State inspector of fire supervision will also check the existence of a contract for maintenance of air ducts and other ventilation systems. Some organizations do it on their own. In this case, you must have the relevant order, where there will be time to clean the accumulation of deposits of dust and grease. As well as the person responsible for the timeliness and accuracy of this process.